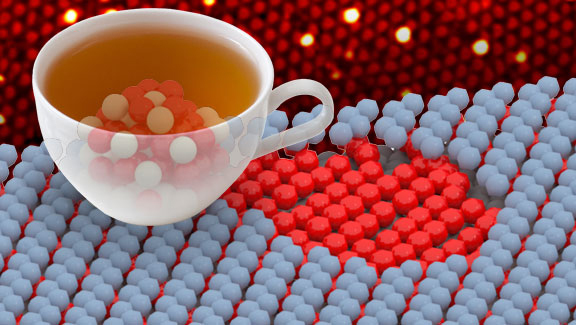 Much like how tea flows through a leaky mug to pool under a table cloth, so oxygen atoms (red) spill out of a tiny cluster to pool under a graphene surface (blue). For the first time, scientists showed how the oxygen spills from the clusters to pool under graphene, providing valuable information for designing the next generation of catalysts, fuel cells, and sensors. Artwork by Ted Tanasse, PNNL Multimedia. Enlarge Image. A graphene sheet on top of ruthenium metal has hills and valley because of their different atom spacing. Cerium oxide clusters (red and white) deposited on the surface fall into the surface's valleys. At low heat, the clusters slowly funnel oxygen under the graphene. There, the oxygen forms pools that flatten the graphene because of weaker graphene interactions. When enough oxygen is funneled through the graphene flattens out completely. At high heat, the graphene starts to etch and is consumed. Enlarge Image. Much like the way tea flowing through a leaky mug pools under a tablecloth, so oxygen atoms flow out of a tiny cluster to pool under an extremely thin carbon sheet. This phenomenon, called oxygen spillover, is often discussed by those wanting to design catalysts to speed processes for biofuels, fuel cells, and sensors. Unfortunately, oxygen spillover is rarely seen. Until now. Scientists at Pacific Northwest National Laboratory and Karl-Franzens University in Austria clearly demonstrated how the oxygen spills. Why It Matters: New catalysts to produce fuels from plant matter could change the future of the nation's energy economy. A catalyst designed to quickly and efficiently promote the right set of reactions needs to have each task done in the right spot, at the right time, and as efficiently as possible. These catalysts need solid supports, just like a home needs the right foundation for the situation. 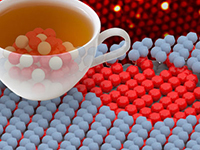 The support on which to design the catalysts could be graphene. This study provides a key page in the design guidebook for catalysts as well as sensors and other devices. Methods: Scientists Novotny and Dr. Zdenek Dohnálek along with Prof. Falko Netzer, one of the leading experts in two-dimensional oxides, laid down an atomically thin sheet of graphene on top of ruthenium metal. The resulting graphene surface has hills and valleys, because of the weak bonds that form between the metal and the graphene. So far, the same approach that has been used before. 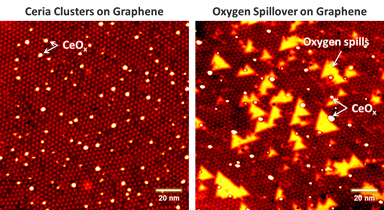 Using scanning tunneling microscopy in DOE's EMSL, scientists can see how ceria clusters settle onto a graphene surface (left) and begin pumping out oxygen atoms (larger yellow areas) under the graphene surface (right). Enlarge Image. In 100 characters: Oxygen atoms leak, pool, and change graphene, a canvas for designing catalysts and sensors. 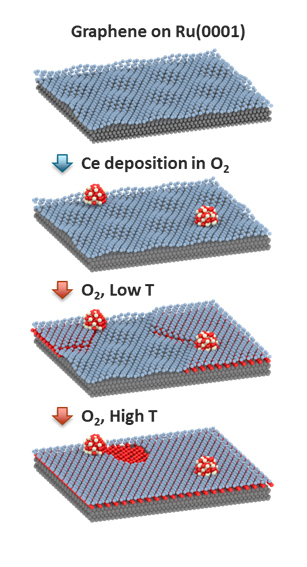 In one sentence: For the first time, scientists at Pacific Northwest National Laboratory and Karl-Frazens University clearly saw oxygen spillover, a phenomenon of interest to catalyst designers.